Welcome to our on-line catalogue. 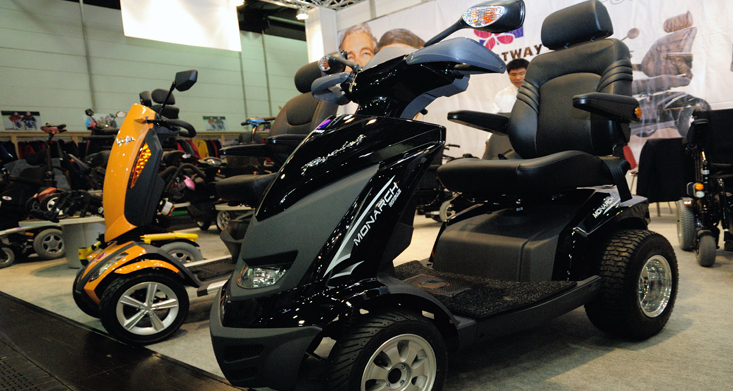 Here you can see our full range of mobility products with their full descriptions. Take your time to browse through the choices and call us if you need any help. When you have chosen, you can buy securely on-line. The majority of these products are eligible for vat exemption and therefore most of the prices shown are excluding VAT. If you (the user) are chronically sick, have a disabling condition or you are registered as being disabled, you may be entitled to VAT exemption and therefore will only have to pay the price shown 'excluding VAT' upon filling in a VAT exemption form (available at checkout). If you are in any doubt as to whether you are eligible to receive goods/services zero-rated for VAT you should consult Customs & Excise notice 701/7 VAT relief for disabled people or contact C&E National Advice Service on 0300 200 3700 before filling in the VAT exemption form. If the product is not eligible for VAT exemption the price stated will be inclusive of VAT at the current rate. We aim to deliver all orders within 2-10 days if the goods are in stock. If the goods you order are "Out of Stock” we will send the order out to you as soon as the product becomes available again. If we cannot source the item we will contact you to inform you. There is a standard delivery charge for goods that can be sent out by courier and set up by the end user. For larger items such as beds, rise and recline chairs, mobility scooters and powerchairs we only offer a white glove delivery service and these goods will be delivered by our own engineers who can set up and demonstrate the products correctly. This will enable you to understand how the product works correctly and become familiar with the safety features. Our engineer will then answer any questions you may have, change any settings for you where possible and make sure you are satisfied with the product before leaving. You can cancel an order and return any goods that may already have been dispatched up to 14 days from receipt (see return policy). Our terms and conditions do not affect your statutory rights. We want you to be happy with your purchase. Please check the goods on delivery and ensure that they are supplied correctly. If any of the goods prove to be unsuitable please return them within 14 days in the original packaging and in an unused condition for a full refund. Enjoy shopping for your mobility products today and do call us if you need any help on 08432 903317.